Anodizing Dye Colors & Setup - SAF Georgia, SAF West, California SAF – Southern Aluminum Finishing Co, Inc. 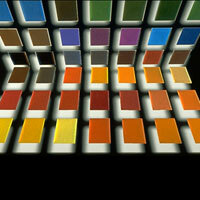 The beauty of aluminum Anodizing Dye Colors is the almost infinite number of colors available. However, be aware that set up is a major factor in planning for any anodizing run. The reason: an anodizer must add anodizing dye in a proper proportion to the anodizing charging tank. parts to be dyed must be completely submerged. As an example, filling a 30′ charging tank with a light fast dye can cost $10,000 or more. The higher the anodizing lot volume, the more cost-effective the process becomes. Which is why most architectural anodizing dye color processing – where protection and durability is most important – is processed in commonly applied clear (silver), bronzes and black colors. It may even be possible to run common anodizing colors (like gold) in SAF Anodizing facilities in Atlanta, Georgia and Redding, California without a set-up charge, depending on timing. Click here for more information on the benefits of anodizing. For detail on Architectural Aluminum Anodizing click: Appearance & Color Variation.